Aberdeen District Motor Co., 487. Accumulators, III, 332, 345, 380, 399, 409, 433, 459, 502, 604. 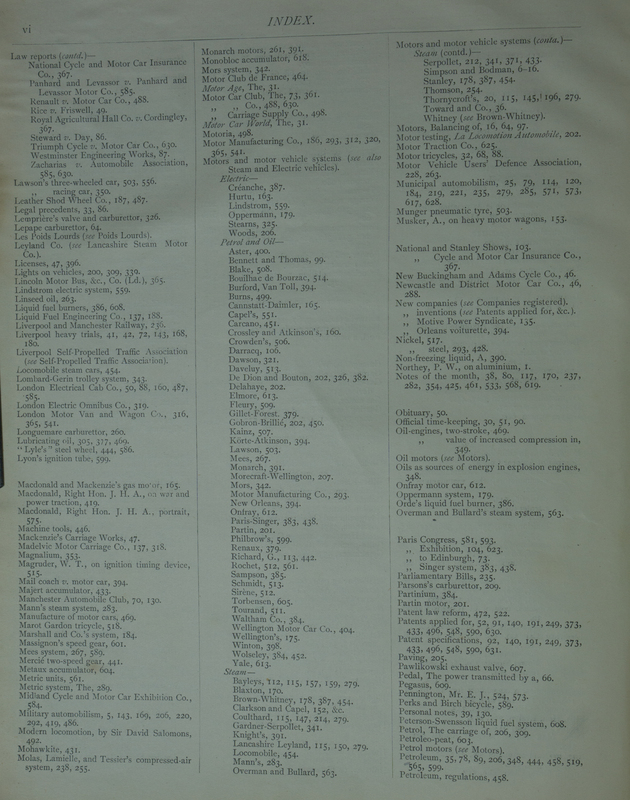 Accumulators for automobiles, high-pressure gas, by E. K. S., III. Accumulators for electromobiles (Rimington), i8, 61, Io8, 141, 216, 253. Accumulators for traction purposes, 617. Accumulator for spark coils, 409. Accumulator, The manufacture of, 502. Acetylene, 352, 383, 508, 615, 625. Admission valve and carburettor, 326. Allday's and Onions' Pneumatic Engineering Co., 135. Aluminium, I, 82, 215, 384, 454, 550. Aluminium,as applied to carriage building, I.
American "Master Patent," An, 526. Anglo-American Rapid Wheel Co., 267. Answers to correspondents, 27, 75, 119, 167, 223, 287, 347, 407, 467, 521, 571, 615. Army and automobilism, The (see Military automobilism). Automobile Association (Ld. ), 367, 431, 489, 490, 585, 630. Automobile Club of France, 63, 464. Automobile Club of Great Britain and Ireland, 40, 68, 75, 83, 126, 180, 229, 294, 306, 350, 355, 411, 474, 527, 576. - Autocar of to-day in Europe and America, 359. - Competition rules, &c., 306, 527, 528. - Electric vehicle trials, 126. - Exhibition, The 1900, 68, 419. 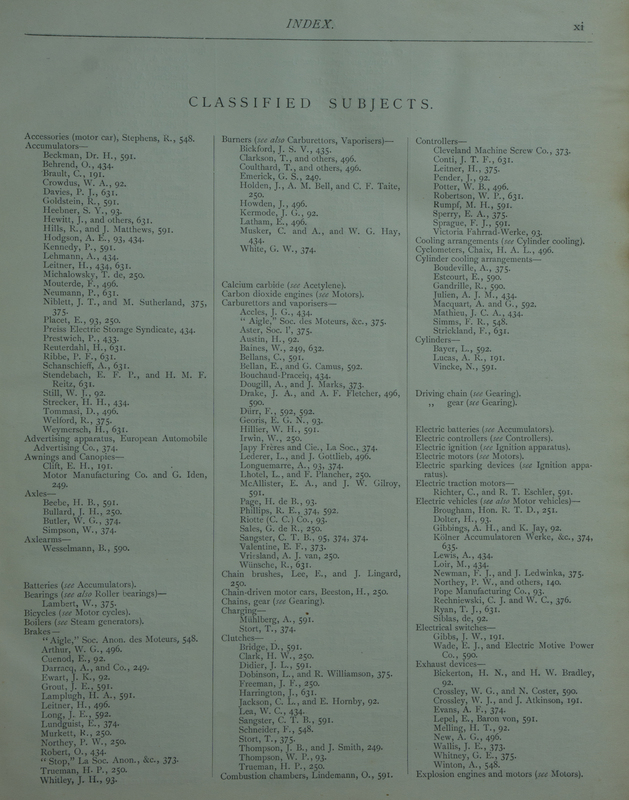 - General aspects of British automobile manufacture, 230. - Hundred n-files trials, 40, 41 [, 529. - Judges' report (Richmond), 83. - Judges' report (1,000 miles), 527, 529. - Kendal to Edinburgh, 358. - Manchester branch, 7o, 13o, 361. - Medal, The Club, 40. - Montagu, Hon. J. Scott, 230. - Notes and notices, 77. - Papers and discussions, 126, 230, 359, 419. - Progressive policy, A, 75. - Racing rules, 306, 528. - Registrations of riders, drivers, and vehicles, 527. - Sheen House run, 7o. - Tare limit, 122, 577. - Thousand-mile trial, 69, 122, 176, 180, 229, 295, 350, 356, 408, 411, 473, 527, 529, 576. - Toll bridges, 528, 577. - War and power traction, 419. Automobile journals, 31, 31, 47. AUTOMOTOR portrait gallery, The, 33, 79, 121, 169, 227, 291, 352, 480. - Beaumont, W. W., 33. - Boys, Professor C. Vernon, 169. - Ellis, Hon. Evelyn, 227. - Langrishe, Captain Hercules R., 353. - Macdonald, Right Hon. J. H. A., 575. - Redwood, Professor Boverton, 291. - Scott-Montagu, M.P., The Hon. John, 79. Bacchus, the harnessing of, 523. Balancing of motors, 16, 64, 97. Bankruptcy Court, 5o, 88, 137, 189, 244, 245. - Beeston Motor Co., 245, 431. - Bradford Cycle and Motor Co., 50. - British Gas Traction Co., 88. - Crowdus Accumulator Syndicate, 245. - Howell, J. C., 137, 189, 368. - Lambert, T. H., 368. - Leathershod Wheel Co., 542. - Liardet, J. E., 542. - London Electrical Cab Co., 5o, 88, 585. - Madelvic Motor Car Co., 137. - Phaeton Electrical Co., 244. Bayley steam lurry, 112, 115, 157, 159, 279. Beaumont, W. W., 33, 210. "Beauty and the Beast," 226. Beeston Motor Co., 186, 43o, 431, 489. Behrend waste heat saving system, 396. Bell, G. J., paper on "Road Management," 494. Bennett and Thomas petrol motor, 99. B. G. S. system, 428, 45o. Blake motors and accessories, 508. Board of Trade Intelligence Department, 215. Bonner rail wagon, 328, 349. Bosville, Mr., on automobilism, 219. Bouilhac de Bourzac motor, 514. Boys, Professor C. Vernon, 169. Brake testing, 17, 31, 572. British Association, 20, 618, 629. British Electric Traction Co., 541, 584. British Gas Traction Co., 88. British Motor Co., 88, 137, 137, 244, 320, 43o, 489, 507, 538, 584. British racing, 45, 82, 133, 429, 465, 518, 568. Brown-Whitney system, 178, 387, 454.
Business notes, 39, 84, 112, 164, 242, 278, 352, 390, 486, 519, 583, 624. Burford van toll system, 394. Burls, G. A., on modern steam wagons, 53. Cab and van trials, French, 423, 581. Caledonian Motor Car and Cycle Co., 85. Carburettors, 25, 64, 209, 260, 326, 510, 561. Carpenter, Professor R. C., on resistances of bicycles, 160. Catalogues, 49, 139, 190, 370, 432, 545. Chelsea and automobilism, 25, 79, 114, 120, 236, 279. Chiswick motor vans, The, 573, 617. Clarkson and Capel system, 152-156, 218. Coachmakers and Coach Harness Makers' Co., 78. Companies registered, New, 47, 85, 136, 187, 243, 318, 366, 430, 487, 541, 584, 625. - Abbey Works Co. (Ld. ), 318. - Aberdare Valley Motor Service Co. (Ld. ), 47. - Aberdeen District Motor Service Co. (Ld. ), 487. - Accles-Turrell Autocars (Ld. ), 243. - Acme Cycle Corporation (Ld. ), 366. - Advance Rim Brake Co. (Ld. ), 430. - Albion Carriage Co. (Ld. ), 487. - Allen and Barker (Ld. ), 584. - Ariel Motor Co. (Ld. ), 366. - Atlas Engineering Co. (Ld. ), 136. - Autocar Supplies Co. (Ld.),625. - Automobile Company of Great Britain and Ireland (Ld. ), 43o. - Automobile Trust (Ld. ), 488. - Ball Chain Co. (Ld. ), 366. - Banchory and Strachan Autocar Co. (Ld. ), 488. - [[Bartlet's "Coranco"[[ (Ld. ), 47. 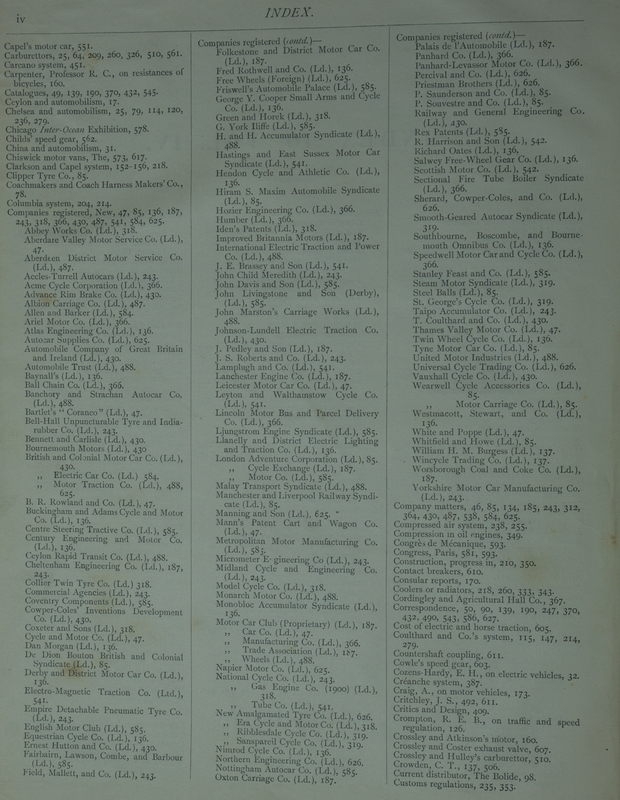 - Bell-Hall Unpuncturable Tyre and India-rubber Co. (Ld. ), 243. - Bennett and Carlisle ld..),),443300. - British Electric Car Co. (Ld.) 584. - British Motor Traction Co. (Ld. ), 488, 625. - B. R. Rowland and Co. (Ld. ), 47. - Buckingham and Adams Cycle and Motor Co. (Ld. ), 136. - Centre Steering Tractive Co. (Ld. ), 585. - Century Engineering and Motor Co. (Ld. ), 136. - Ceylon Rapid Transit Co. (Ld. ), 488. - Cheltenham Engineering Co. (Ld. ), 187, 243. - Collier Twin Tyre Co. (Ld.) 318. - Commercial Agencies (Ld. ), 243. - Coventry Components (Ld. ), 585. - Cowper-Coles' Inventions Development Co. (Ld. ), 430. - Coxeter and Sons (Ld. ), 318. - Cycle and Motor Co. (Ld. ), 47. - Dan Morgan (Ld. ), 136. - De Dion Bouton British and Colonial Syndicate (Ld. ), 85. - Derby and District Motor Car Co. (Ld. ), 136. - Empire Detachable Pneumatic Tyre Co. (Ld. ), 243. - English Motor Club (Ld. ), 585. Equestrian Cycle Co. (Ld. ), 136. - Ernest Hutton and Co. (Ld. ), 43o. - Fairbairn, Lawson, Combe, and Barbour (Ld. ), 585. - Field, Mallett, and Co. (Ld. ), 243. - Folkestone and District Motor Car Co. (Ld. ), 187. - Fred Rothwell and Co. (Ld. ), 136. - Free Wheels (Foreign) (Ld. ), 625. - Friswell's Automobile Palace (Ld. ), 585. - George Y. Cooper Small Arms and Cycle Co. (Ld. ), 136. - Green and Horek (Ld. ), 318. - G. York Iliffe (Ld. ), 585. - H. and H. Accumulator Syndicate (Ld. ), 488. - Hastings and East Sussex Motor Car Syndicate (Ld. ), 541. - Hendon Cycle and Athletic Co. (Ld. ), 136. - Hiram S. Maxim Automobile Syndicate (Ld. ), 85. - Hozier Engineering Co. (Ld. ), 366. - Iden's Patents (Ld. ), 318. - Improved Britannia Motors (Ld. 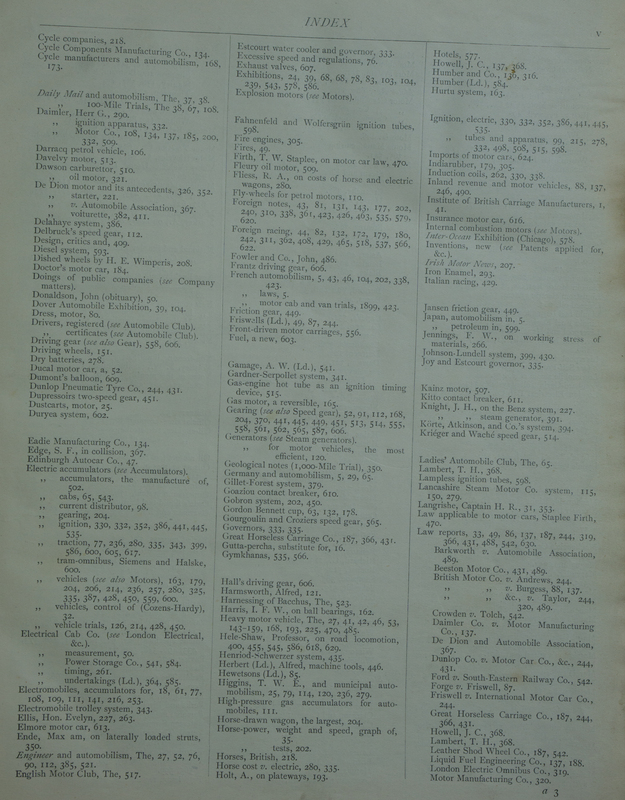 ), 187. - International Electric Traction and Power Co. (Ld. ), 488. - J. E. Brassey and Son (Ld. ), 541. - John Child Meredith (Ld. ), 243. - John Davis and Son (Ld. ), 585. - John Livingstone and Son (Derby), (Ld. ), 585. - John Marston's Carriage Works (Ld. ), 488. - Johnson-Lundell Electric Traction Co. (Ld. ), 430. - J. Pedley and Son (Ld. ), 187. - J. S. Roberts and Co. (Ld. ), 243. - Lamplugh and Co. (Ld. ), 541. - Lanchester Engine Co. (Ld. 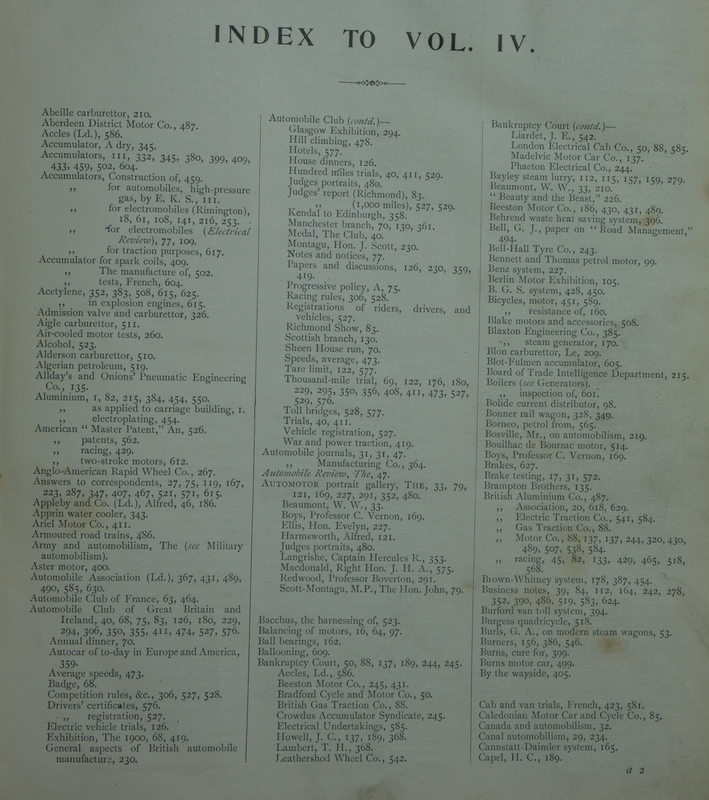 ), 187. - Leicester Motor Car Co. (Ld. ), 47. - Leyton and Walthamstow Cycle Co. (Ld. ), 541. - Lincoln Motor Bus and Parcel Delivery Co. (Ld. ), 366. - Ljungstrom Engine Syndicate (Ld. ), 585. - Llanelly and District Electric Lighting and Traction Co. (Ld. ), 136. - London Adventure Corporation (Ld. ), 85. - London Cycle Exchange (Ld. ), 187. - London Motor Co. (Ld. ), 585. - Malay Transport Syndicate (Ld. ), 488. - Manchester and Liverpool Railway Syndicate (Ld. ), 85. - Manning and Son (Ld. ), 625. - Manns Patent Cart and Wagon Co. (Ld. ), 47. - Metropolitan Motor Manufacturing Co. (Ld. ), 583. - Micrometer Engineering Co (Ld. ), 243. - Midland Cycle and Engineering Co. (Ld. ), 243. - Model Cycle Co. (Ld. ), 318. - Monarch Motor Co. (Ld. ), 488. - Monobloc Accumulator Syndicate (Ld. ), 136. - Motor Car Club (Proprietary) (Ld. ), 187. - Motor Car Co. (Ld. ), 47. - Motor Manufacturing Co. (Ld. ), 366. - Motor Wheels (Ld. ), 488. - Napier Motor Co. (Ld. ), 625. - National Cycle Co. (Ld. ), 243. - National Gas Engine Co. (1900) (Ld. ), 318. - National Tube Co. (Ld. ), 541. - New Amalgamated Tyre Co. (Ld. ), 626. - New Era Cycle and Motor Co. (Ld. ), 318. - New Ribblesdale Cycle Co. (Ld. ), 319. - New Sanspareil Cycle Co. (Ld. ), 319. - Nimrod Cycle Co. (Ld. ), 136. - Northern Engineering Co. (Ld. ), 626. - Nottingham Autocar Co. (Ld. ), 585. - Oxton Carriage Co. (Ld. 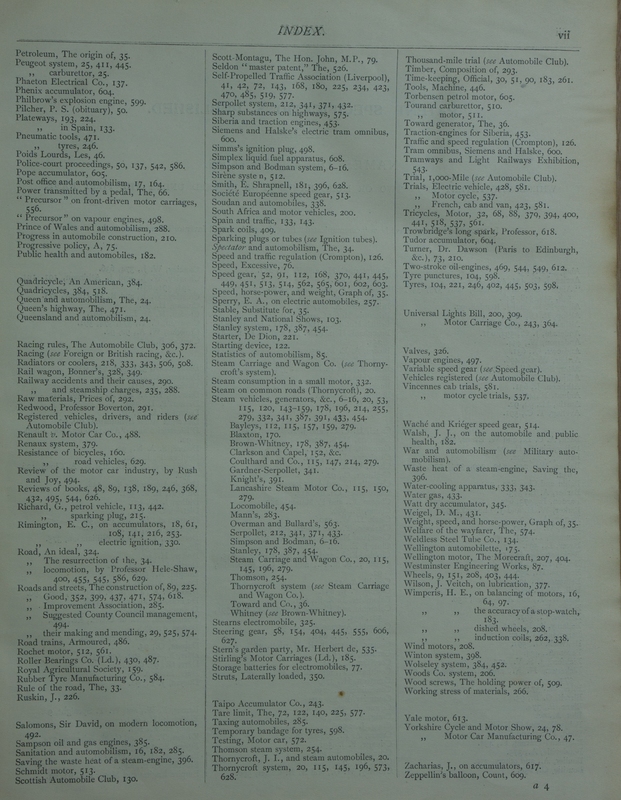 ), 187. - Palais de l'Automobile (Ld. ), 187. - Panhard Co. (Ld. ), 366. - Panhard-Levassor Motor Co. (Di. ), 366. - Percival and Co. (Ld. ), 626. - Priestman Brothers (Ld. ), 626. - P. Saunderson and Co. (Ld. ), 85. - P. Souvestre and Co. (Ld. ), 85. - Railway and General Engineering Co. (Ld. ), 430. - Rex Patents (Ld. ), 585. - R. Harrison and Son (Ld. ), 542. - Richard Oates (Ld. ), 136. - Salwey Free-Wheel Gear Co. (Ld. ), 136. - Scottish Motor Co. (Ld. ), 542. - Sectional Fire Tube Boiler Syndicate (Ld. ), 366. - Sherard, Cowper-Coles, and Co. (Ld. ), 626. - Smooth-Geared Autocar Syndicate (Ld. ), 319. - Southbourne, Boscombe, and Bournemouth Omnibus Co. (Ld. ), 136. - Speedwell Motor Car and Cycle Co. (Ld. ), 366. - Steam Motor Syndicate (Ld. ), 319. - Steel Balls (Ld. ), 85. - St. George's Cycle Co. (Ld. ), 319. - Taipo Accumulator Co. (Ld. ), 243. - T. Coulthard and Co. (Ld. ), 430. - Thames Valley Motor Co. (Ld. ), 47. - Twin Wheel Cycle Co. (Ld. ), 136. - Tyne Motor Car Co. (Ld. ), 85. - United Motor Industries (Ld. ), 488. - Universal Cycle Trading Co. (Ld. ), 626. - Vauxhall Cycle Co. (Ld. ), 43o. - Wearwell Motor Carriage Co. (Ld. ), 85. - Westmacott, Stewart, and Co. (Ld. ), 136. - White and Poppe (Ld. ), 47. - Whitfield and Howe (Ld. ), 85. - William H. M. Burgess (Ld. ), 137. - Wincycle Trading Co. (Ld. ), 137. - Worsborough Coal and Coke Co. (Ld. ), 187. - Yorkshire Motor Car Manufacturing Co. (Ld. ), 243. Company matters, 46, 85, 134, 185, 243, 312, 364, 430, 487, 538, 584, 625. Compressed air system, 238, 255. Compression in oil engines, 349. Construction, progress in, 210, 350. Cordingley and Agricultural Hall Co., 367. Correspondence, 50, 90, 139, 190, 247, 370, 432, 490, 543, 586, 627. Cost of electric and horse traction, 605. Coulthard and Co.'s system, 115, 147, 214, 279. Cozens-Hardy, E. H., on electric vehicles, 32. Craig, A., on motor vehicles, 173. Critchley, J. S., 492, 611. Crompton, R. E. B., on traffic and speed regulation, 126. Crossley and Atkinson's motor, 160. Crossley and Coster exhaust valve, 607. Crossley and Hulley's carburettor, 510. Crowden, C. T., 137, 506. Current distributor, The Bolide, 98. Cycle Components Manufacturing Co., 134. Cycle manufacturers and automobilism, i68, 173. Daily Mail and automobilism, The, 37, 38. Daily Mail 100-Mile Trials, The 38, 67, IoS. Daimler Motor Co., Io8, 134, 137, 185, 200, 332, 509. De Dion motor and its antecedents, 326, 352. De Dion v. Automobile Association, 367. De Dion voiturette, 382, 411. Dished wheels by H. E. Wimperis, 208. Doings of public companies (see Company matters). Dover Automobile Exhibition, 39, 104. 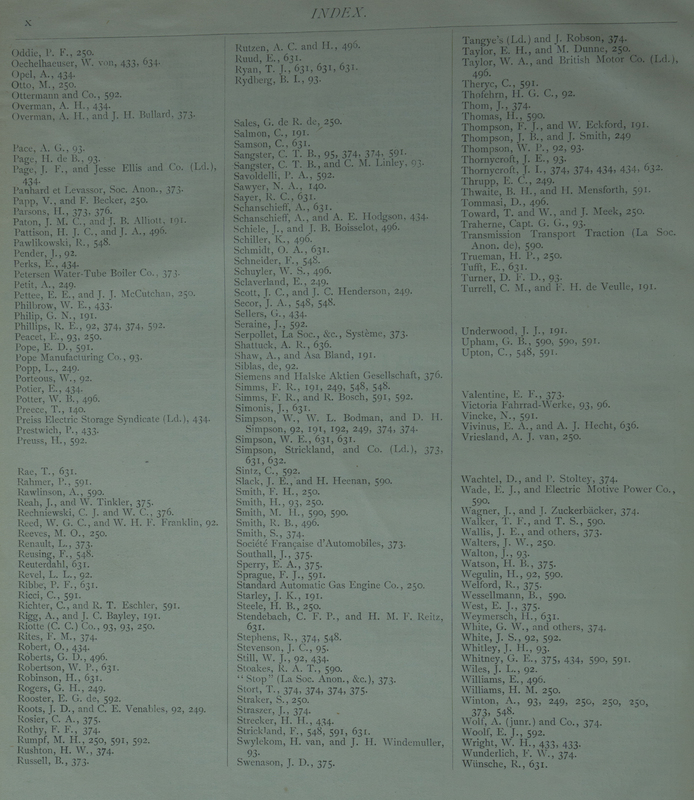 Drivers, registered (see Automobile Club). Drivers certificates (see Automobile Club). Driving gear (see also Gear), 558, 6o6. Ducal motor car, a, 52. Dunlop Pneumatic Tyre Co., 244, 431. Edge, S. F., in collision, 367. Electric accumulators, the manufacture of, 502. Electric traction, 77, 236, 280, 335, 343, 399, 586, 600, 605, 617. Electric tram-omnibus, Siemens and Halske, 600. Electric vehicles (see also Motors), 163, 179, 204, 206, 214, 236, 257, 280, 325, 335, 387, 428, 450, 559, 600. Electric vehicles, control of (Cozens-Hardy), 32. Electric vehicle trials, 126, 214, 428, 450. Electrical Power Storage Co., 541, 584. [[Electrical Undertakings] (Ld. ), 364, 585. Electromobiles, accumulators for, 18, 61, 77, 108, 109, III, 141, 216, 253. Ellis, Hon. Evelyn, 227, 263. Ende, Max am, on laterally loaded struts, 35o. Engineer and automobilism, The, 27, 52, 76, 90, 112, 385, 521. English Motor Club, The, 517. Estcourt water cooler and governor, 333. Excessive speed and regulations, 76. Exhibitions, 24, 39, 68, 68, 78, 83, 103, 104, 239, 543, 578, 586. Fahnenfeld and Wolfersgriin ignition tubes, 598. Firth, T. W. Staplee, on motor car law, 47o. Fliess, R. A., on costs of horse and electric wagons, 280. Fly-wheels for petrol motors, 'rm. Foreign notes, 43, 81, 131, 143, 177, 202, 240, 310, 338, 361, 423, 426, 463, 535, 579, 62o. Foreign racing, 44, 82, 132, 172, 179, 180, 242, 311, 362, 408, 429, 465, 518, 537, 566, 622. Fowler and Co., John, 486. French automobilism, 5, 43, 46, 104, 202, 338, 423. French motor cab and van trials, 1899, 423. Friswalls (Ld. ), 49, 87, 244. Gamage, A. W. (Ld. ), 541. Gas-engine hot tube as an ignition timing device, 515. Gas motor, a reversible, 165. Gearing (see also Speed gear), 52, 91, 112, 168, 204, 370, 441, 445, 449, 451, 513, 514, 555, 558, 561, 562, 565, 587, 6o6. Geological notes (I,000-Mile Trial), 35o. Germany and automobilism, 5, 29, 65. Gordon Bennett cup, 63, 132, 178. Gourgoulin and Croziers speed gear, 565. Great Horseless Carriage Co., 187, 366, 43 r .
Harnessing of Bacchus, The, 523. Harris, I. F. W., on ball bearings, 162. Heavy motor vehicle, The, 27, 41, 42, 46, 53, 143-159, 168, 193, 225, 470, 485. Hele-Shaw, Professor, on road locomotion, 400, 455, 545, 586, 618, 629. Herbert (Ld. ), Alfred, machine tools, 446. Higgins, T. W. E., and municipal automobilism, 25, 79, 114, 120, 236, 279. High-pressure gas accumulators for automobiles, III. Horse-drawn wagon, the largest, 204. Horse cost v. electric, 280, 335. Holt, A., on plateways, 193. Howell, J. C., 137, 68. Humber and Co., IA, 316. Ignition, electric, 330, 332, 352, 386, 441, 445, 535. Imports of motor cars, 624. Induction coils, 262, 330, 338. Inland revenue and motor vehicles, 88, 137, 246, 490. Institute of British Carriage Manufacturers, 1, 41. Internal combustion motors (see *AI ()tors). 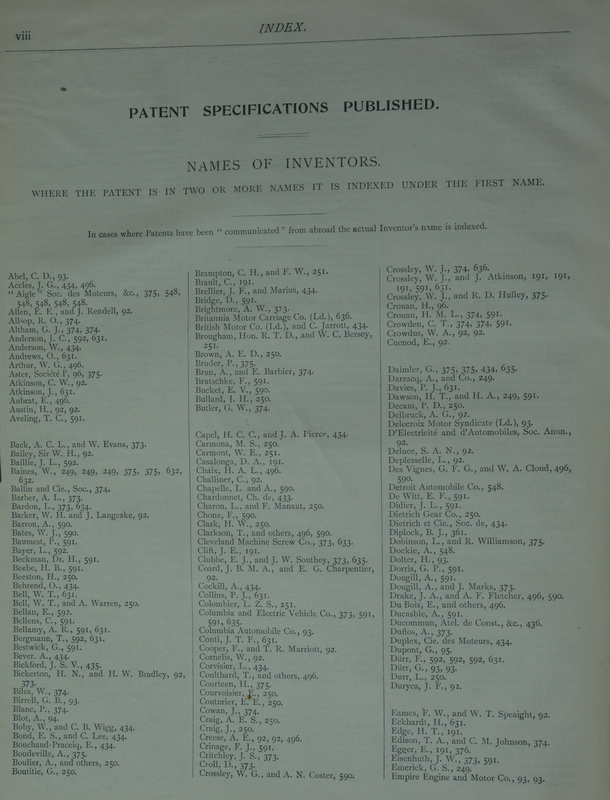 Inventions, new (see Patents applied for, &c.). Jennings, F. W., on working stress of materials, 266. Joy and Estcourt governor, 335. Knight, J. H., on the Benz system, 227. Knight, J. H., steam generator, 391. 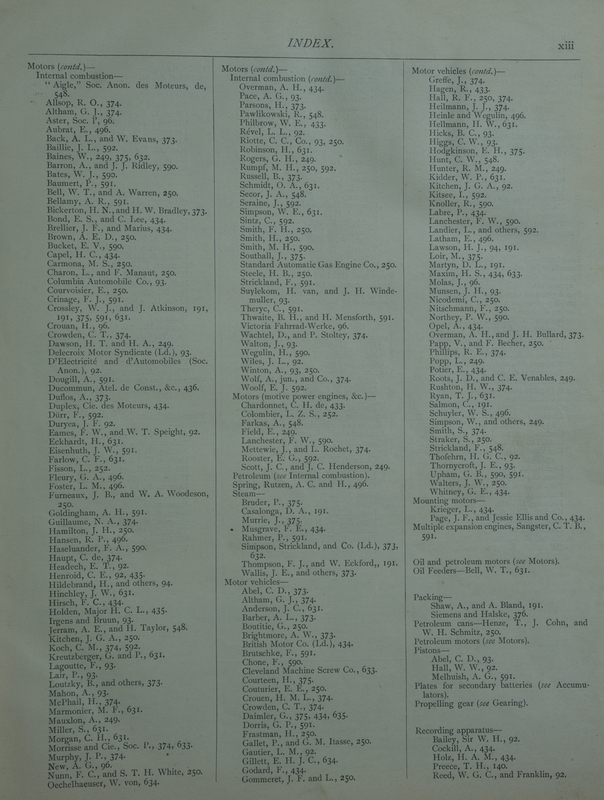 Korte, Atkinson, and Co.'s system, 394. Krieger and Wache speed gear, 514. Ladies' Automobile Club, The, 65. Lancashire Steam Motor Co. system, 115, 150, 279. Langrishe, Captain H. R., 31, 353. Law reports, 33, 49, 86, 137, 187, 244, 319, 366, 431, 488, 542, 630. - Beeston Motor Co., 431, 489. - British Motor Co.British Motor Co.&c. , v. Taylor, 244, 320, 489. - Crowden v. Tolch, 542. - Daimler Co. v. Motor Manufacturing Co., 137. - De Dion and Automobile Association, 367. - Ford v. South-Eastern Railway Co., 542. - Forge v. Friswell, 87. - Friswell v. International Motor Car Co., 244. - Great Horseless Carriage Co., 187, 244, 366, 431. - Howell, J. C., 368. - Leather Shod Wheel Co., 187, 542. - Liquid Fuel Engineering Co., 137, 188. - London Electric Omnibus Co., 319. - Motor Manufacturing Co., 320. - National Cycle and Motor Car Insurance Co., 367. - Panhard and Levassor v. Panhard and Levassor Motor Co., 585. - Renault v. Motor Car Co., 488. - Rice v. Friswell, 49. - Royal Agricultural Hall Co. v. Cordingley, 367. - Steward v. Day, 86. - Triumph Cycle v. Motor Car Co., 63o. - Westminster Engineering Works, 87. - Zacharias v. Automobile Association, 585, 630. Leather Shod Wheel Co., 187, 487. Lempriere's valve and carburettor, 326. Les Poids Lourds (see Poids Lourds). Leyland Co. (see Lancashire Steam Motor Co.). Lights on vehicles, 200, 309, 339. Lincoln Motor Bus, &c., Co. (Ld. ), 365. Liquid fuel burners, 386, 6o8. Liquid Fuel Engineering Co., 137, 188. Liverpool and Manchester Railway, 236. Liverpool heavy trials, 41, 42, 72, 143, 168, 180. Liverpool Self-Propelled Traffic Association (see Self-Propelled Traffic Association). London Electrical Cab Co., 50, 88, 160, 487, 585. London Electric Omnibus Co., 319. London Motor Van and Wagon Co., 316, 365, 541. Lubricating oil, 305, 377, 469. "Lyle's" steel wheel, 444, 586. Macdonald and Mackenzie's gas motor, 165. Macdonald, Right Hon. J. H. A., on war and power traction, 419. [[J. H. A. Macdonald|Macdonald, Right Hon. J. H. A., portrait, 575. Madelvic Motor Carriage Co., 137, 318. Magruder, W. T., on ignition timing device, 515. Mail coach v. motor car, 394. Manchester Automobile Club, 7o, 130. Manufacture of motor cars, 469. Marshall and Co.'s system, 184. Military automobilism, 5, 143, 169, 206, 220, 292, 419, 486. Modern locomotion, by Sir David Salomons, 492. Molas, Lamielle, and Tessier's compressed-air system, 238, 255. Motor Club de France, 464. [Motor Car Club], The, 73, 361. [Motor Car Co]., 488, 63°. Motor Carriage Supply Co., 498. Motor Car World, The, 31. Motor Manufacturing Co., 186, 293, 312, 320, 365, 541. Motors and motor vehicle systems (see also Steam and Electric vehicles). - Bennett and Thomas, 99. - Bouilhac de Bourzac, 514. - Burford, Van Toll, 394. - Crossley and Atkinson's, i6o. - De Dion and Bouton, 202, 326, 382. - Motor Manufacturing Co., 293. - Richard, G., "3, 442. - Wellington Motor Car Co., 404. - Bayleys, 112, 115, 157, 159, 279. - Brown-Whitney, 178, 387, 454. - Clarkson and Capel, 152, &c.
- Coulthard, 115, 147, 214, 279. - Lancashire Leyland, 115, 150, 279. - Overman and Bullard, 563. - Serpollet, 212, 341, 371, 433. - Simpson and Bodman, 6-16. - Stanley, 178, 387, 454. - Thornycroft's, 20, 115, 145,1196, 279. - Toward and Co., 36. Motors, Balancing of, 16, 64, 97. Motor testing, La Locomotion Automobile, 202. Motor tricycles, 32, 68, 88. Motor Vehicle Users' Defence Association, 228, 263. Municipal automobilism, 25, 79, 114, 120, 184, 219, 221, 235, 279, 285, 571, 573, 617, 628. Musker, A., on heavy motor wagons, 153. National and Stanley Shows, 103. National Cycle and Motor Car Insurance Co., 367. New Buckingham and Adams Cycle Co., 46. Newcastle and District Motor Car Co., 46, 288. New companies (see Companies registered). New Motive Power Syndicate, 135. Northey, P. W., on aluminium, 1. Official time-keeping, 30, 51, 90. Oil-engines, value of increased compression in, 349. Oils as sources of energy in explosion engines, 348. Orde's liquid fuel burner, 386. Overman and Bullard's steam system, 563. Paris Singer system, 383, 438. Patent law reform, 472, 522. Patents applied for, 52, 91, 140, 191, 249, 373, 433, 496, 548, 590, 630. Patent specifications, 92, 140, 191, 249, 373, 433, 496, 548, 590, 631. Pedal, The power transmitted by a, 66. Pennington, Mr. E. J., 524, 573. Perks and Birch bicycle, 589. Peterson-Swensson liquid fuel system, 608. Petrol, The carriage of, 206, 309. Petroleum, 35, 78, 89, 206, 348, 444, 458, 519, 565, 599. - The origin of, 35. Peugeot system, 25, 411, 445. Pilcher, P. S. (obituary), 5o. Police-court proceedings, 50, 137, 542, 586. Post office and automobilism, 17, 164. Power transmitted by a pedal, The, 66. "Precursor" on front-driven motor carriages, 556. "Precursor" on vapour engines, 498. Prince of Wales and automobilism, 288. Progress in automobile construction, 210. Public health and automobiles, 182. Queen and automobilism, The, 24. Racing rules, The Automobile Club, 306, 372. Racing (see Foreign or British racing, &c.). Radiators or coolers, 218, 333, 343, 506, 508. Rail wagon, Bonner's, 328, 349. 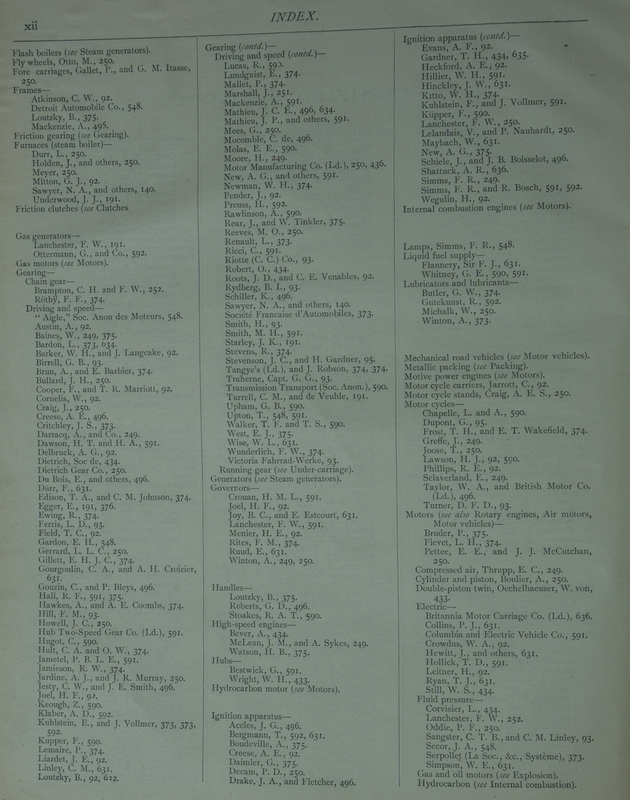 Railway accidents and their causes, 290. Railway and steamship charges, 235, 288. Raw materials, Prices of, 292. Registered vehicles, drivers, and riders (see Automobile Club). Renault v. Motor Car Co., 488. Resistance of road vehicles, 629.
Review of the motor car industry, by Rush and Joy, 494. Reviews of books, 48, 89, 138, 189, 246, 368, 432, 495, 544, 626. Rimington, E. C., on accumulators, 18, 61, 14 141, 216, 253. - electric ignition, 33o. 400, 455, 545, 586, 629. Road, The resurrection of The, 34. Roads and streets, The construction of, 89, 225. Roads Good, 352, 399, 437, 471, 574, 618. Roads Suggested County Council management, 494. Roads, their making and mending, 29, 525, 574. Roller Bearings Co. (Lcl. ), 430, 487. Rubber Tyre Manufacturing Co., 584. Rule of the road, The, 33. Sampson oil and gas engines, 385. Sanitation and automobilism, 16, 182, 285. Saving the waste heat of a steam-engine, 396. Scott-Montagu, The Hon. John, M.P., 79. Seldon "master patent," The, 526. Self-Propelled Traffic Association (Liverpool), 41, 42, 72, 143, 168, 180, 225, 234, 423, 470, 485, 519, 577. Serpollet system, 212, 341, 371, 432. Sharp substances on highways, 575. Siberia and traction engines, 453. Siemens and Halske's electric tram omnibus, 600. Simplex liquid fuel apparatus, 608. Simpson and Bodman system, 6-16. Smith, E. Shrapnell, 181, 396, 628. Societe Europeenne speed gear, 513. South Africa and motor vehicles, 200. Spain and traffic, 133, 143. Sparking plugs or tubes (see Ignition tubes). Spectator and automobilism, The, 34. Speed and traffic regulation (Crompton), 126. Speed gear, 52, 91, 112, 168, 370, 441, 445, 449, 451, 513, 514, 562, 565, 6o1, 602, 603. Speed, horse-power, and weight, Graph of, 35. Sperry, E. A., on electric automobiles, 257. Stanley and National Shows, 103. Steam Carriage and Wagon Co. (see Thornycroft's system). Steam consumption in a small motor, 332. Steam on common roads (Thornycroft), 20. Steam vehicles, generators, &c., 6-16, 20, 53, 115, 120, 143-159, 178, 196, 214, 255, 279, 332, 341, 387, 391, 433, 454. - Coulthard and Co., 115, 147, 214, 279. - Lancashire Steam Motor Co., 115, 150, 279. - Overman and Bullard's, 563. - Steam Carriage and Wagon Co., 20, I 15, 145, 196, 279. - Thornycroft system (see Steam Carriage and Wagon Co.). Steering gear, 58, 154, 404, 445, 555, 6o6, 627. Stern's garden party, Mr. Herbert de, 535. Stirling's Motor Carriages (Ld. 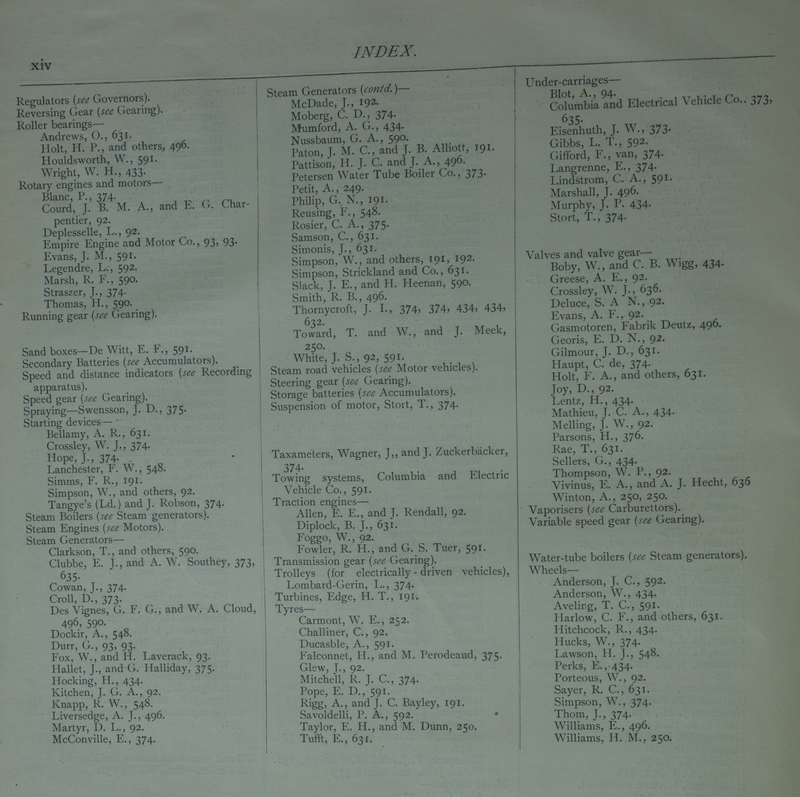 ), 185. Storage batteries for electromobiles, 77. Tare limit, The, 72, 122, 140, 225, 577. Temporary bandage for tyres, 598. Thornycroft, J. I., and steam automobiles, 20. Thornycroft system, 20, 115, 145, 196, 573, 628. Thousand-mile trial (see Automobile Club). Time-keeping, Official, 3o, 51, 90, 183, 261. Traffic and speed regulation (Crompton), 126. Tram omnibus, Siemens and Halske, 600. Tramways and Light Railways Exhibition 43. Trial, 1,000-Mile (see Automobile Club). Trials, Electric vehicle, 428, 581. Trials, French, cab and van, 423, 581. Tricycles, Motor, 32, 68, 88, 379, 394, 400, 441, 518, 537, 561. Trowbridge's long spark, Professor, 618. Turner, Dr. Dawson (Paris to Edinburgh, &c.), 73, 210. Two-stroke oil-engines, 469, 544, 549, 612. Tyres, 104, 221, 246, 402, 445, 503, 598. Universal Lights Bill, 200, 309. Universal Motor Carriage Co., 243, 364. Variable speed gear (see Speed gear). 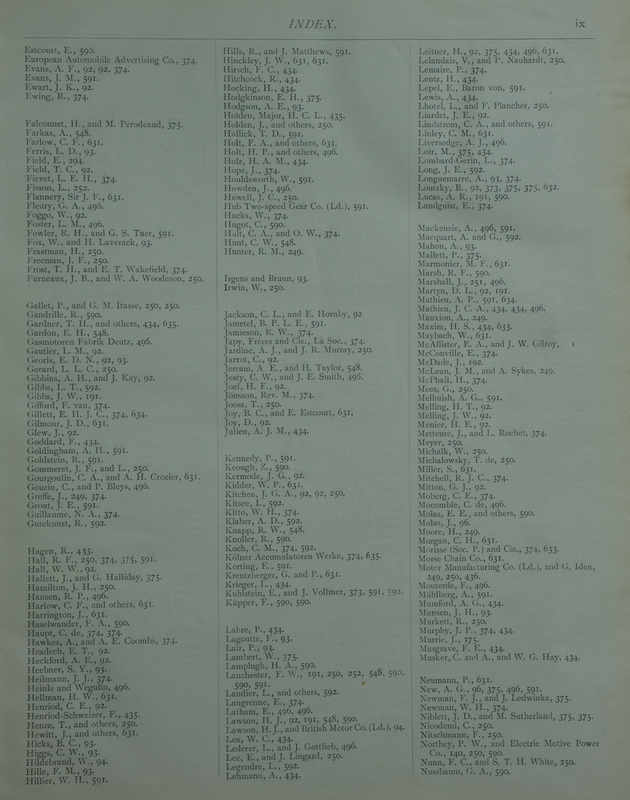 Vehicles registered (see Automobile Club). Vincennes motor cycle trials, 537. Wache and Krieger speed gear, 514. Walsh, J. J., on the automobile and public health, i82. War and automobilism (see Military automobilism). Waste heat of a steam-engine, Saving the, 396. Weight, speed, and horse-power, Graph of, 35. Welfare of the wayfarer, The, 574. Weldless Steel Tube Co., 134. Wellington motor, The Morecraft, 207, 404. Wheels, 9, 151, 208, 403, 444. Wilson, J. Veitch, on lubrication, 377. Wimperis, H. E., on balancing of motors, 16, 64, 97. - induction coils, 262, 338. Wood screws, The holding power of, 509. Working stress of materials, 266. Yorkshire Cycle and Motor Show, 24, 78. Yorkshire Motor Car Manufacturing Co., 47. Zacharias, J., on accumulators, 617. This page was last edited on 30 January 2019, at 18:11.